We provide hands on assistance to disability claimants who have been denied long term disability insurance benefits. RamosLaw has represented clients throughout the Northeast, particularly in New England. We have two main offices, one in Hartford, Connecticut and the other one in Lawrence, Massachusetts. In addition we have satellite offices in Worcester, Springfield and Boston. The Connecticut office is managed by attorney Ivan Ramos and the Massachusetts office is managed by attorney Tere Ramos. Our state of the art paperless office gives us the ability to represent clients in a wide geographical area and, at the same time, maintain the feel of a small town practice. We always offer free initial consultation. In most cases our office does not charge legal fees unless we win. Monday to Friday 9:00 AM to 5:00 PM. Feel free to contact us anytime through our free consultation form. Attorney Ivan Ramos is a native Spanish language speaker. He fully is fluent in Spanish. RamosLaw is a disability law firm dedicated to meeting the legal needs of individuals who are seeking long term disability benefits from private insurance companies or from the Social Security Administration. Our firm can assist you with your ERISA Long Term Disability case in almost any part of the U.S. or Puerto Rico. In Social Security cases, we represent claimants anywhere in Connecticut or Massachusetts, from our conveniently located offices in Hartford, Springfield, Worcester, Lawrence and Boston. Attorneys Ivan and Tere Ramos are proud to provide their clients with hands on, personalized representation that cannot be matched by larger firms. They take aggressive actions to protect their client's rights, assuring that they receive the benefits they are entitled to under the law. In fact, RamosLaw the law firm that professional and executives turn to when they are afflicted with a chronic illness or condition that prevents them from working. At RamosLaw, we believe that working in disability law is more than just a job or a business opportunity it is our social calling. Our desire to take on these types of cases comes out of our commitment to pursue economic justice and social equality. The only right way to help our clients is to put our hearts into every case we take on. In addition to passion and commitment to his clients needs, Attorney Ivan Ramos has two decades of experience as a lawyer. He works with all aspects of the disability claims process everyday and has spent years learning about the complex world of ERISA Long Term Disability and Social Security law. His office staff also has an excellent working relationship and experience with those who review and handle claims at disability insurance companies and at the Social Security Administration. With his vast experience and thorough knowledge of the law, he is a great advocate to have on his clients' side. Ivan Ramos and his staff will work diligently for the benefit of their clients to obtain the financial security that they deserve. The Law Office of Ivan A. Ramos, LLC is a law firm dedicated to meeting the legal needs of individuals who are injured or disabled. Our office can assist you with your Social Security Disability case anywhere in Connecticut or in Massachusetts. Attorney Ivan A. Ramos is proud to provide his clients with the hands on, personalized representation that larger firms often lack. He takes aggressive steps in order to protect his client's rights and assure that they obtain fair compensation or that they receive the benefits that they deserve under the law. At the Law Office of Ivan A. Ramos, LLC, we believe that working in the disability and personal injury area of the law is more than just a job or a business opportunity. Helping those who are injured or disabled is our social calling. The desire to work in these cases comes out of our commitment to economic justice and social equality. This is why we say that the only right way to do this job is by putting our hearts in every case that we take. In addition to passion and commitment to his clients needs, Attorney Ivan Ramos counts with two decades of experience as a lawyer; he has vast experience and a thorough knowledge of the law, and knows what it takes to win your case. He works with all aspects of the Social Security Disability process every single day of the week and has spent years learning about the complex world of Social Security laws and regulations. His office staff has an excellent working relationship with those who review and handle claims in Connecticut or in Massachusetts and works with a state of the art electronic system that allows him to submit case documents electronically to the Social Security Administration. The office is almost completely paperless and can transact most of its business with its clients online. In personal injury cases, attorney Ramos and his staff will work diligently for the benefit of their clients and the just financial compensation that they deserve. When dealing with an insurance company, it is far more advantageous to have an accomplished, experienced lawyer like him your corner than to go it alone. Ramos volunteers for several organizations that help persons with chronic conditions and disabilities. From 2011 to 2014, Ramos served on the Board of Directors of the Lupus Foundation of America, Connecticut Chapter. During part of his term, he served as secretary to the board. In 2013, Ramos was appointed by the Connecticut Chief Court Administrator to the Connecticut Attorney Assistance Advisory Committee. This committee oversees the organization that provides crisis intervention to fellow lawyers who suffer from behavioral health issues or from chronic health conditions. For the past two years, RamosLaw has been the proud sponsor of Los Indios de Mayaguez, a little league team in Hartford's Hispanic Community. The team is named after the professional baseball team in Ramos' home town of Mayaguez. Clients who are seeking disability benefits receive personalized attention from Attorney Ramos throughout the entire process. We understand that this is a difficult time for you and know that preparing a complex appeal is the last thing on your mind when you are trying to cope with a serious medical condition. In many instances, we have seen how these hardships are worsened by the financial constraints that are created when a claimant is unable to work. For this reason, we believe that part of our responsibility as a law firm is to work as a team with your doctors, medical providers and loved ones. In addition, we do not charge you any legal fees until the insurance company issues the payments that you are entitled to. If you do not get paid by the insurance company, we do not charge you for our legal fees. You are only responsible for paying the costs associated with pursuing the appeal. We believe that clients who are willing to learn about the legal issues that affect them, are more likely to obtain a favorable result. Ivan A. Ramos has been practicing law for over two decades. He has focused tirelessly in protecting the financial future of disabled individuals. By concentrating in disability benefits law, he has been able to acquire the knowledge and experience needed to succeed against billion-dollar disability insurance companies. Ivan Ramos was born in Mayaguez, Puerto Rico, the son of two lawyers. His parents instilled in him the importance of helping people and serving justice. They constantly reminded him that his ancestors in the Western part of the Island had very humble beginnings. "From them, I learned the importance of giving back to the community and helping those less fortunate in their hour of need" says Ramos. In his law practice, he consults on a regular basis with his parent's law firm in San Juan, on diverse legal issues, particularly in the area of federal court practice. Ramos believes that working in the disability benefits area of the law is more than just a job or a business opportunity. Helping those who are injured or disabled is his social calling. When he takes your case, he put's his heart into it. This passion for working with those who are disabled or injured is deeply rooted in his firm commitment to economic justice and social equality. RamosLaw represents persons from all walks of life. From doctors and professionals, to individuals living in homeless shelters, his office provides everyone with the same exceptional service. In addition to working in long term disability insurance cases, Ramos represents Social Security Disability Claimants throughout Connecticut and Massachusetts. He works with all aspects of the Social Security Disability process and has spent years learning about the complex world of Social Security laws and regulations. Ramos is a sustaining member of NOSSCR: the National Organization of Social Security Claimants' Representatives. He attends NOSSCR's national conferences on a regular basis. 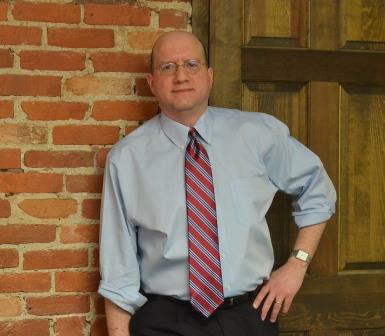 His offices are conveniently located in downtown Hartford and downtown Springfield. He is also available to meet clients at other locations throughout New England. In personal injury cases, he focuses solely in representing accident victims in Connecticut Courts. Attorney Ramos received his legal education from the University of Connecticut School of Law, (J.D.). He received his B.A. from Clark University, where he majored in English. He is fluent in Spanish.